The Village of VesseauxLe old village is of ancient origin, and probably Carolingian Gallo-Roman. You will among other things, visit the church with its porch ranked the 12th century, (European Network of sites in the Chaise Dieu), his strange tower in glazed tiles of the 19th century, and the fortified hamlet. 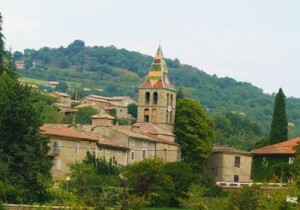 Vesseaux, one of the larger villages of Ardeche with its 40 hamlets, famous for its chestnut trees, is located 7 kms from Aubenas and about 350m above sea level. In the village, some for shelter, numerous marked trails.